Of all the teams in the Oahu Interscholastic Association, the iron men of Kalaheo probably deserved a rest. With six two-way starters and a strong senior class, the Mustangs kicked off the season with success. Then injuries and fatigue took a toll, and they crossed the finish line a bit weary and gimpy. Heart took them far, but a little rest is on the way, in the nick of time. Yesterday's coin flip at the OIA athletic directors meeting in Kailua gave order to the three-way tie in the Red East football standings. Playoff qualifiers Kalaheo, Castle and Kailua had finished regular-season play at 3-3. The coin flip gave Kalaheo the third seed in the playoffs. Castle has the fourth seed and Kailua the fifth. The top three teams in the East get first-round byes, so Kalaheo joins East No. 1 Kahuku and second-place Farrington on the sideline this week. In the Red West, Mililani, Waianae and Kapolei have byes. In the first round of the playoffs Castle meets Leilehua on Friday at Mililani's John Kauinana Stadium. On Saturday, Kailua visits Kapolei. Stirring up the pot is something Seabury Hall has learned to do over the years. These days, it's the girls volleyball team that has turned up the heat. The Spartans, with wins over neighboring Upcountry Maui rivals King Kekaulike and Kamehameha-Maui, improved to 10-0 over the weekend. Voters in the Star-Bulletin Top 10 rewarded the Spartans with a No. 5 ranking, the program's highest ever. Not bad for a tiny Division II squad from Olinda. Yacine Meyer, a four-year starter, leads the Spartans into the Maui Interscholastic League playoffs this week. They aren't the only hot team in the league. Division I powerhouse Kamehameha-Maui was upset by D-II Molokai. The Farmers (9-1) aren't ranked yet, but their victory knocked the Warriors out of the Top 10. Iolani, which had last week off after winning the Interscholastic League of Honolulu's first round, collected nine of 10 first-place votes to remain at No. 1. The Raiders, who have already earned a state tournament berth, will meet Sacred Hearts in this week's ILH second-round tournament. Kamehameha and Punahou meet in the other semifinal. 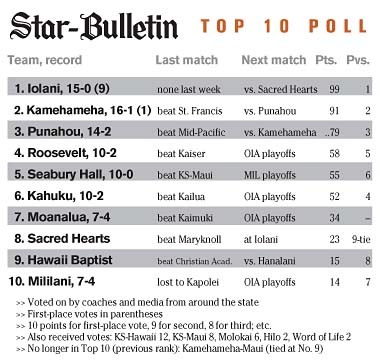 The league has three state berths this season, so Sacred Hearts, Kamehameha and Punahou still have hope even with a loss on Thursday. Sacred Hearts, ranked eighth, pushed Iolani to three games in their last matchup two weeks ago. Moanalua, which hit a midseason skid, finished regular-season play strong with a win over Kahuku. Na Menehune returned to the Top 10 at No. 7. "We are finally playing as a team," coach Tommy Lake said. "I hope it continues."